Even if it's cold outside, you can make your home a place of fun energy and excitement at her next birthday party with Frozen Party Supplies! Simple tableware and decorations with Elsa, Anna, and Olaf, as well as cool party favors like bubble blowers, photo props, necklaces, and personalized favor bags are all here! Let it go and party on, Frozen style. Frozen is the hit animated film inspired by Hans Christian Andersen's fairy tale The Snow Queen. The Disney film tells the story of princess Anna of Arendelle, who sets off on an epic journey alongside rugged iceman Kristoff, his loyal pet reindeer Sven, and hilarious snowman Olaf to find her sister Elsa, whose icy powers have trapped the kingdom in eternal winter. Princess Elsa possesses cryokinetic powers, which means she can produce or manipulate ice, frost and snow at will. The story and characters inspire little girls to be fearless, and the movie has great songs they love to sing along with. Possibly the most popular party theme of the decade, you can’t go wrong with Frozen. Let the storm rage on, and the party begin. Make a master list of supplies you’ll need for the party and shop ahead for decorations, tableware and take-away gift bags. That’ll leave less to think about when the date is near. Possible supplies you’ll need: decorations like streamers, balloons, party hats and signs. You’ll need tablecloths, plates, cups and utensils, too. Find party ideas and get creative with the help of our Ideas & Inspiration blog. We’ve got the latest themes, trends and great DIY party ideas (how about an Olaf Party?). You’ll find girls’ themes, boys’ themes, first-birthday ideas and events. We’ll help you get creative, even if you’re really not. Invite guests to your little princess’ magical day with these Disney Frozen invitations. Send out our Disney Frozen Invitations to your girl’s friends and give them a glimpse of the fun that awaits. 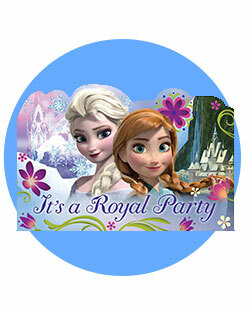 Let all the little ones get excited thinking about a fun party with Anna and Elsa. Every birthday party needs to be decorated, especially a Frozen party. Decorations set the scene. They let kids show their interests and spend time with their favorite characters. Without party decorations, it’s just a bunch of kids hanging out on a play date. Add balloons, banners, themed table décor, even a piñata, and you’ve got a real party! Make Anna and Elsa the stars, or Olaf the centerpiece. Bring the magic of Frozen alive and carry the theme throughout the venue. Create a magical wonderland of ice and fun. It’s time to celebrate, so don’t forget the confetti! Float in the fun with a Frozen balloon bouquet! Great for adding decoration anywhere in the party room, they also make wonderful centerpieces or even a chair decoration for the guest of honor. Put it together quickly with our balloon bouquet kit, which includes 10 balloons of various sizes, curling ribbon and a blue metallic balloon weight. You don’t have to be a professional baker to make the most beautiful Frozen birthday cake in all the land. Just use our DIY Frozen cake decorations kit. It includes all the rings, candles, Sixlet candies and rock candy sticks you’ll need to transform an ordinary cake into a magical ice fantasy cake. Set the table in style with Frozen-themed plates, napkins, cups and more. 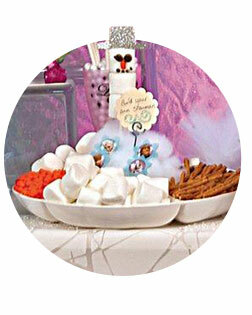 Use plates for snacks and cake adorned with images of their favorite princesses, Anna and Elsa. Mix and match with Anna and Elsa paper cups, and some hot pink plastic forks and spoons. You can’t forget Olaf, they certainly won’t. Add the snowy funnyman to the mix with a fun plastic table cover. For a royal touch, add princess goblets that look like the real thing. So let them eat cake as they drink their lemonade in princess style. Party-themed tableware pulls it all together and will keep them asking for more. A Frozen birthday party isn’t complete without things to keep little princesses busy. Maybe have a sing-along, or set up a karaoke stage for them to belt out their favorite Frozen tunes. Have them play dress-up with dresses, shoes and tiaras you provide. Set up a photo booth with a Frozen-themed backdrop to let them bring out their inner model and create a great memento of the day. A piñata with surprises inside ramps up the excitement. A party game where they can help Olaf find his nose is sure to be a huge hit. No kid wants to sit still, so keep them moving and engaged with games and activities! Let her be the star of her party and bring out her inner ice powers with the Disney Frozen Deluxe Elsa Costume. It includes a beautiful ice-blue dress, adjustable belt and golden tiara. Just add sparkly shoes to complete the transformation. She’ll feel special and she might even invite her friends to dress up, too! Piñatas have been around for centuries for a reason: kids love them. And they’ll love the Frozen piñata even more. Our Disney Frozen Pinata Kit has everything you want for your celebration, including a Frozen Pull-String Piñata, candy and toy fillers, blindfold and piñata buster. Anna and Elsa love to share, and so does Olaf. 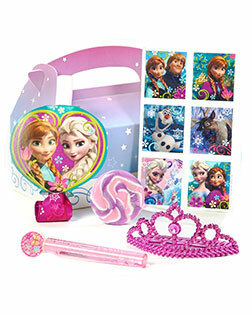 Let your little princess share the wealth with fun Frozen party favors. Stock up on everything Arendelle with this large selection of takeaways. You can’t go wrong with jewels and sparkles, tiaras, wands and, of course, stickers. Don’t forget edible treats like lollipops and candy. Games and toys can be added for hours of fun, too. Thank them for coming with a gift bag chock-full of Frozen favors. They’ll leave with a huge smile on their faces and fond memories of a birthday party with plenty of pizzazz. Send your snow princess’s guests home with something to remember the big day by; treat them to a Frozen Filled Party Favor Container featuring Anna, Elsa and all of their favorite characters. 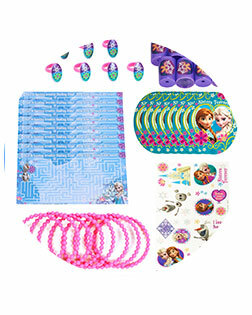 The Disney Frozen Party Favor Value Pack has takeaway favors for all your little princesses at a price the whole kingdom will love. The value pack has a big 48 favors (six each for eight guests) and comes with bracelets, rings, stickers, a maze game and more!